I know I haven't posted in a while, but you know, life! Anyway, most of my designing recently has been for magazines. 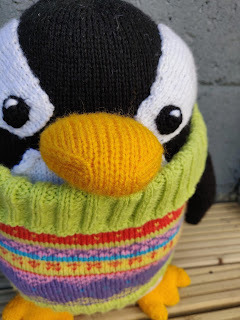 However, an upcoming event inspired me to create a new pattern - the Jumper Wearing Gentoo. My engineer younger sister has been selected to join the Homeward Bound team for 2019 to visit Antarctica. Homeward Bound was set up to connect women worldwide who work in STEM roles and work together to tackle climate change. Its a year long programme of study and collaboration that culminates with a trip to Antarctica. Its a fantastic opportunity for her and as one of only two Irish women chosen to participate it is a huge honour. It is though, a rather costly honour! She hopes to raise most of her fundraising through corporate donations and sponsorship. My little contribution is this pattern. All money raised from pattern sales will go towards he travel costs - and probably a few coats! !